Happy Tuesday! 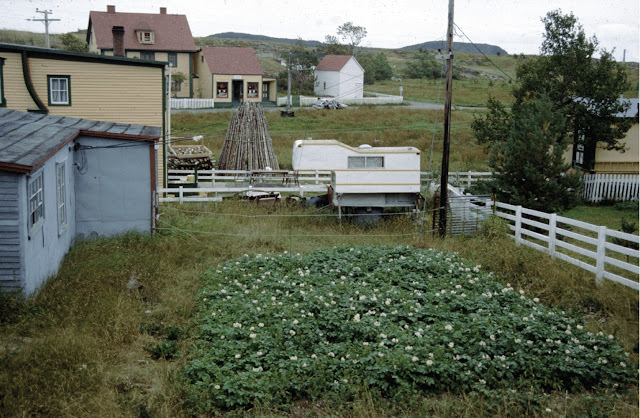 For this week's Folklore Photo, a lovely view of a potato garden in flower in Trinity, Trinity Bay. I have been assisting the Agricultural History Society of NL with some of their files, soon to be uploaded to the Digital Archives Initiative, under the "Knowledge and Practices Concerning Nature and the Universe" section of the ICH Inventory. This is one of the photos in their collection that will be included. The photo was undated and unnamed, but that is the Hiscock House there in the background, now a provincial historic site. I love the wood stacked up behind the garden, as well. The photo was used in a panel prepared by the Agricultural History Society circa 2008, but the photo might be older. If you recognize it, email me at ich@heritagefoundation.ca or leave a comment below!